This is one of those, you-learn-something-new-every-day facts, at least it was a new one by me. Show of hands, how many of you know about, Blue Zones? The term refers to an anthropological model describing the characteristics and environments of locations with the world’s most centenarians. It was first coined in a 2005 National Geographic cover story by Dan Buettner; via some indisputable statistics, Buettner identified five geographic areas on earth with a large concentration of healthy and active people who live well into their 100s. Costa Rica is one of them. To explain this incredible connubial excursion, will be employing a triple entendre. (How often does that opportunity show up.) The first one is in the books, the obvious definition, Blue Zones are not only cool and healthy places to live, they’re desirable; who doesn’t want to drink from the fountain of youth? Not a bad destination to plop down. The second blue zone refers to the waters of our Costa Rican beach, translucent crystal blue, canvased by a floor of tiny white shells. At this particular resort, instead of sand beneath your feet, there are trillions of little broken shells that make up the terrain. Tough to walk on, (it doesn’t hurt, you just sink, the water doesn’t bind it like sand) but what a sight to behold. On the third day there we did a little snorkeling. Very little. The waves were too strong and insisted on muscling us into the rocks, (Shay and BK brought home some nasty scrapes as souvenirs.) Sticking close to the shore was the only safe option. The search for colorful aquatic life was replaced by an astonishing ambient spectacle. Floating on the spirited surface, the delicate white base swirled and danced below in a crystalline concert. Oblivious to the windy world above, with each churn, the only thing you could hear was the tiny shells skipping over each other, chiming a song of tranquility. Truly enchanting; the perfect metaphor for the final blue zone, Sully and Ashlee’s wedding weekend. When you look up “true blue” in Webster’s, it describes one who’s loyal, faithful and a constant source of support; no matter what. For me, the perfect description of family. Not always the blood variety, some of those have the name but haven’t really earned it, nope, talking about the people in life who love you unconditionally. The ones who would cut off their right arm for you if they thought it would help. This wedding was populated with that kind of kinfolk. People we could be separated from for long stretches, but it wouldn’t change a thing, the bond is precious and permanent. A testament to the love Sully, Ashlee and their families have spread, they had over 40 people make the trek to Costa Rica to celebrate their nuptials. The joy of their destination wedding was amplified tenfold by the guests they gathered. The wedding venue, the Pangas Beach Club, was about a half hour from the resort and it was the stuff bridal dreams are made of. 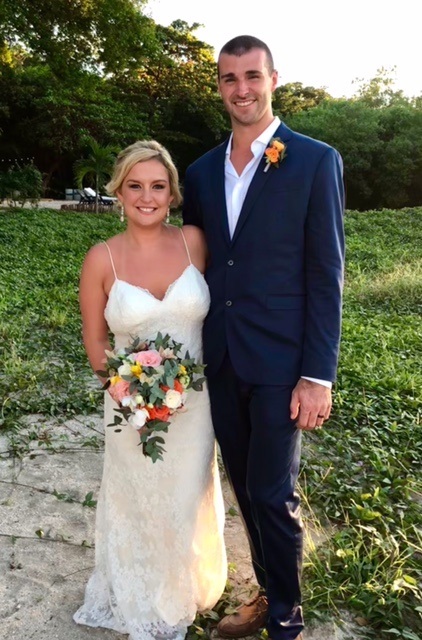 With an ancient Banyan tree that sat on the shoreline as their backdrop, Sully and Ashlee said, I do. Did I mention BK, (or his customary moniker for such events, Rev Kev,) performed the ceremony? Had quite a few of us a little wet of eye. After all, this is family, in the truest sense; heartfelt words are easy to come by. BK always puts the best of them together. After the ceremony came convivial pictures at sunset, phenomenal finger food, a divine din din, and then we all danced the night away. When it was time to head back, our busload sang Christmas carols the whole way. A memorable night, to say the least. This was no ordinary event, think we all felt it, there was a serendipitous quality to the gathering. It was an unexpected gift. Kindness, laughter and love were on the itinerary. Like the magical waters, it was an enchanting journey. Four days together wasn’t enough, none of us wanted to leave. There’s no doubt about it, the wedding party, families and all the guests at this special occasion were in the zone. The true blue zone; a perfect destination, no matter where you might be.